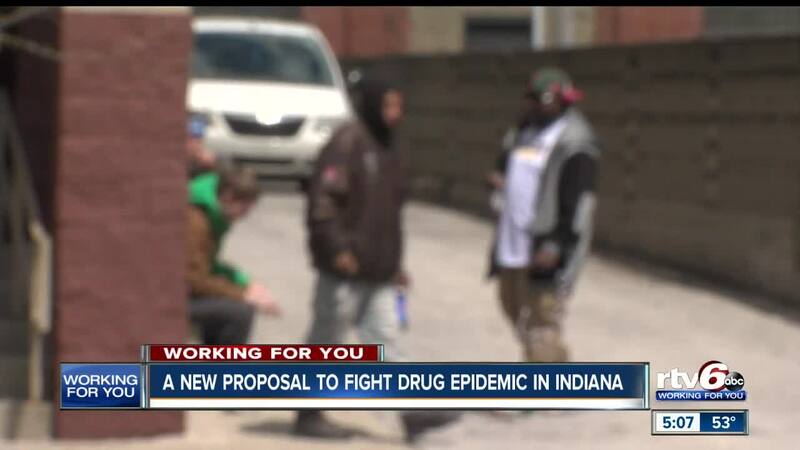 A new proposal to fight drug epidemic in Indiana. INDIANAPOLIS — A proposal at the statehouse calls for stiffer penalties on drug users and dealers as a new plan to fight the drug epidemic around Indiana. Last year, within just 24 hours, 25 people overdosed right around Wheeler Mission. A men's homeless shelter near downtown Indianapolis. Police later arrested the suspect who was selling the synthetic drugs. Wheeler Mission says they support any legislation that creates stricter laws for drug dealers targeting the most vulnerable. "It's a struggle to be able to persevere and push through," Trevor Sebastian, a former addict, said. Sebastian knows how hard it is to stay on the road to recovery. Sebastian was addicted to methamphetamine and almost died three times. He says what makes sobriety even more difficult is a temptation. When Sebastian sees drug dealers waiting around near Wheeler Mission - to prey on people they very well know are recovering addicts and are there trying to seek help - he gets furious. "It makes me angry," Sebastian said. "It's sad that people are willing to… people are trying to better themselves, and they're willing to leech on that and prey on that. And that brings up a lot of anger." For this reason, and to crack down on drug dealers, lawmakers are trying to bump up drug dealing charges from a level five felony to a level four felony, if they're within a specific distance from a recovery facility. This former addict, who's now giving back to the program that helped him, thinks it's a great idea. "I think it should be a stronger punishment. I think you're taking advantage of people trying to do something different, and we are in an epidemic, and we're trying to get out of it - not go into it," Sebastian said. "So I think by increasing the punishment that might keep some people away." Lawmakers are still debating specifics on how far dealers have to be from a facility to receive the enhanced charges. RTV6 will follow up with updates from the statehouse.